Josh: Good morning, Cathryn. Thank you. Cathryn: Here is the agenda for today. This should take around 30 minutes, with 20 minutes from us and then time at the end to answer your questions. Do send in your questions and comments using the box on the screen at anytime and we will try to answer them at the end. If you miss anything from today’s broadcast, don’t worry. We will send an on-demand recording to you by email tomorrow. So, you can pre-watch that, or share it with your colleagues if you think they’ll be interested. I’m going to hand it over to Josh now. To tell us about the importance of crafting and delivering a brilliant onboarding experience and how CIPHR’s tools can help you do that. Josh: Hello, good morning everyone. Thank you, Cathryn. So firstly, we are going to take a look at what onboarding actually is. So, onboarding is the action or process of receiving and integrating new employees into an organisation and its culture. Its purpose is to acclimate a new employee and to assist them in acquiring the necessary skills, knowledge, and behaviors to become an effective member of staff from the outset. Onboarding also serves the purpose of retaining new employees and building on the momentum created during the recruitment process. Cathryn: Okay, just to get you started, we’re going to send out our first poll today. What percentage of your new hires would you say leave within the first 12 months of their employment with you? You have five options on your screen to choose from, between naught and 20%, between 21% and 40%, between 41% and 60%, between 61% and 80%, and between 81% and 100%. Just choose one of those options. Don’t worry. It will be anonymous. We’re not going to share who voted in which box with anyone else on the line. Josh, where would you expect our audience to fall on this? Josh: I hopefully expect to see that the numbers are at the lower end of the scale. We don’t want to see that people are leaving their roles early on. But I think the idea is that is we know it does happen, so maybe up to around the 21% to 40% bracket, into that region potentially. Cathryn: Okay, thanks Josh for that analysis. I’m going to close the poll now and share the results on your screen. Falling in line with what Josh was talking about there, we have 52% of you saying that between naught and 20% of your new hires leave within their first 12 months, which seems really positive. We have 33% of you creeping up into that next bracket, between 21% and 40%, which is probably a little bit more concerning for you. So, it’s great to have you with us to find out how onboarding can help you reduce that [inaudible 00:02:39] might improve your retention. And I’m very worried for the probably just one person who voted between 81% and 100%. Hopefully you aren’t doing huge volumes of new hires a year, and maybe that’s just a high percentage of a small number of recruits. So, Josh is now going to explore about the business impact of a great onboarding experience. Josh: Yes, thank you, Cathryn. And, yeah, the results were sort of what I was expecting. So, taking all of that into account, we’re going to look and see why brilliant onboarding matters. So, employees now expect more of organisations, and they begin to form those opinions of the organisation from the moment the job offer is accepted. Ultimately, if there’s a lack of connection, or an employee doesn’t feel like they belong or are embedded into an organisation, then the likelihood is that they’ll obviously seek pastures new. And research by Christian Harpelund, who’s the consulting director of the Onboarding Group, found that approximately 25% of new hires leave their organisation within the first 12 months. So that kind of fits with what we’ve seen there from the first poll. And due to the implications of lost productivity, recruiting fees, retraining, and other potential outlays, the actual cost of losing a new employee within that window is equal to approximately two years salary. Obviously, ultimately, you’ll likely have gone to great lengths and costs to recruit this new employee into your organisation, therefore the onboarding process really needs to match your recruitment efforts in its quality and intensity. Early engagement and focus on that new employee capitalizes on their excitement of starting a new role and bringing them into your organisation’s ethos and culture from the outset, and that can only be a good thing. Again, Christian Harpelund’s research reports this in showing that organisations with structured and standardized onboarding processes generally experience around 54% higher productivity from new employees and twice the level of engagement. So those results really just show how key getting onboarding right is. Without a positive and impactful start, the chances are that your new employee will not deliver on expectations and will not feel that their work is meaningful. And, actually, when these individuals do succeed, they help your organisation grow and reach its goals. And with this in mind, we see onboarding of new hires is a critical factor in organisation success. Cathryn: Okay, thanks, Josh, for that overview. And we’re going to move on, now, to our second poll. Would you say that you have a robust onboarding strategy? A simple yes or no response here, please. Josh, where do you think our audience are on this? Do you think they’re here to find out the secrets of onboarding success, or because they just want to rather enhance what they already have in place? Josh: It’s going to be an interesting one, I think, Cathryn. I think there can be quite a split between the answers here. I feel we’ll probably swing more towards no, but hopefully people are here to learn a bit more about how we can support them in building that. Cathryn: Okay, yeah, the results are in, and they confirm our suspicions. So, 55% of you say no, you wouldn’t have a robust onboarding strategy, and it’s really nice to see that 45% of you would say that you do. So that’s fantastic. We’re going to carry on now. Back over to Josh. He’s going to whiz you through a little bit more about Oonboarding itself. Josh: Yeah, so we’re going to take a look, actually, at how our CIPHR Onboarding module can help in developing a robust onboarding strategy. So firstly, we really just want you please think about this from the perspective of someone waiting to start a new job. You’re probably feeling a mixture of nerves, anxiousness, and some excitement. But above all of that, you expect that there’s a real willingness to learn more about your new organisation, the colleagues you’re going to be working with, and your job role itself. CIPHR’s Onboarding tool helps you really capitalize on the willingness to learn and provides a platform to help support your new employee in succeeding in their new role. So, as part of their job acceptance, you can provide your new hire with a login to access the onboarding portal. Now, this is just a small window of your HR system, and I’m going to take you through some CIPHR examples of potential content. The real key thing to note is that these are just some examples of the type of content that can be configured to assist you in conveying your message and then what is most important to you as an organisation. Ultimately, CIPHR Onboarding is providing you with the framework to fill. So, there are two key parts to CIPHR Onboarding. Firstly, you provide your new hire with access to input or update all of their personal information, for example. That can be address or bank details. Secondly, when your new hire logs in, they’ll be taken through an intuitive workflow that guides them through the onboarding content. So, as we see here, you could choose to have an introductory or welcome message from senior management, whether that’s in the form of text, or a picture, or even an embedded video. The choice is really yours. You could use this to form the basis or background for building your organisation culture, which you can then build on with further information. Here at CIPHR, our culture is built on the 4 Ps, so being positive, professional, pioneering, and passionate. But you could promote your own values, or the messages that form the basis of your organisation culture. You could also give your new employee the opportunity to hear from some of their colleagues. So, you could look to do this, again, in the form of maybe pictures of key members of the team with direct quotes from them, or as we have here, reviews from Glassdoor about the organisation. You could also choose to give your employees access to a company organisation chart so they can understand the organisational structure, see the bigger picture of who works where, and then how they fit within that hierarchy. A key part of our continued development of CIPHR is feedback from our customers. And an example here, we opted to include is a floor plan of the building. So, this was actually originally developed with input from the Natural History Museum, as they realized the benefit that it would provide to them in helping new employees navigate their building, actually where they needed to go on their first day. So there your employee has access to amend their information using the tabs and pages at the top of the page. You can highlight to them specific sections that you would like to complete and can even be linked to the specific pages within the text description. You can provide your employee access to the relevant documentation, for example, their contract of employment, or ask them to update all their relevant skills and qualifications. Also, if you have our policy acceptance module, you could ask your new employee to familiarize themselves and sign off all relevant policies before they start. So, not only does that provide protection for your employee, in that they will have already been able to gain valuable information around emergency procedures before they even set foot in the building for the first day, but it also saves working time in allowing the employee to do this in their own time before they even cross that threshold on their first day, and they can get straight into meeting their new colleagues and getting to grips with their role. Our additional policy acceptance module allows users to confirm when they have read and understood a policy. This then time-and-date stamps the record, so that also provides you with a clear and auditable trail of who has completed all of their policies and when. An important consideration for most employees is the rewards or benefits that they’ll get from working at an organisation. So, you can opt to have details of all, or just some, of the important benefits that you as an organisation provide. This could be as small as something like a charity bake-off, or as significant as the pension scheme they’re going to be enrolled in as part of joining the organisation. And you can also use the content to provide information on the products or services that you, as an organisation, provide. And this helps your employee get up to speed quickly on what you do. As we saw previously, you could look to embed a video of a product demonstration, or of a current employee talking about a particular service you offer, or even a webinar like this one. Or you could provide text information or links to further content for them to view as well. Finally, then, you could provide them with a link to contact you should they have any questions, and a sign off message to complete the walkthrough of the onboarding content. Also, I’d just like to reconfirm from what we’ve seen that the walkthrough we’ve just gone through of that content is of course only an example. When implementing CIPHR Onboarding, we work with you to fill out that framework with your own content to ensure you’re conveying, obviously, what’s most important to you as an organisation, and for your employee to get to grips with and understand. So then, to summarize, CIPHR Onboarding provides both benefits to you, from an HR and administration perspective, and your new employee. So, from the HR and administration perspective, you can replace the time and labor-intensive manual tasks and processes of printing, and sending welcome packs, or manually entering basic employee details into multiple systems. You can define your reputation and build a strong employer brand by developing content to promote your message, enhancing your methods of communication, and ultimately generating greater engagement from your employees. You can also support your compliance practices and protect your employees by using our additional policy acceptance module in conjunction with the onboarding. So then, from an employee’s perspective, they’re also able to access the information at anytime, so from any internet-enabled device, so that they can complete all of those administrative tasks before their first day, whenever and wherever suits them. So, in that typical sort of black out period, once they’ve accepted a role with you, before they start, they can do this all at their own leisure, from the comfort of their own home. And completion of these tasks before their first day, allows your new employee to hit the ground running when they start with you, and being able to focus on actually getting to grips with their new role rather than spending time on administrative tasks. So, by providing your new employee with this easily-accessible, rich, and engaging content, and information about the organisation and its culture, their team and the working environment they’re going to be in, you’re likely to make them feel more welcome, reduce those potential first day nerves, and even turn those nerves into real excitement. Josh: Yeah, absolutely. So, an example of that would be our CIPHR Learning products, which is our Learning Management system. So, you could also provide, from the development tab on the onboarding pages, access to that content for your employees. That may be something like mandatory training, or induction training content, that again you can ask them to complete before their first day. The trick here, I suppose, would be to support your onboarder with enough content to challenge them before they start, but not too much that you’re overburdening them with that at the time. So, yeah absolutely, it’s possible to link to other business systems. Another one would be, for example, your recruitment software. We obviously have CIPHR iRecruit. That then automatically creates your candidate, your new hire, into the system that you can put into the onboarding user role and be able to set them straight on their path to a successful career with you. Cathryn: Great, thank you. And we have a question from Mirade [SP]. I hope I said your name right. She asks, “Can we link up to other sites? For example, to our pension scheme rather than duplicate the information in two places.” Is that possible? Josh: When you’re looking at, for example, the benefits pages, if it was a case of you were advising them that their benefit is their pension scheme, when you configure the text, absolutely. You could put a link to an external website, so your pension provider, that they can then click on and go and find out further information from there as opposed to you inputting all of the information for them to see, reading it there, and having to go somewhere else to read it again. You could link them straight to the horse’s mouth, so to speak, and get the information right where they need it. Cathryn: I hope that answers your question, Mirade. We have a great comment here from Jillian in response to the poll we ran earlier asking about whether or not you considered yourself to have a robust onboarding process. Jillian writes that, “Most organisations probably have a robust onboarding process in some areas, but not consistently across the organisation.” Josh, how far can HR teams use CIPHR Onboarding to target the induction process for different roles, or different departments, or different locations within their company? Josh: I think the thing we have to consider is that an HR department within an organisation, you may have hundreds of employees in an HR team or only a few. So, it’s difficult to impact across the board from that perspective. The getting it right across the board and having different types of content, if it’s a case of you have specific elements relating to certain areas of your business, then that’s certainly something to discuss with your account manager if you have further interest in looking at the onboarding module and how we can help make that work for you. As we’ve seen, the framework is really yours to fill with with what is right for your organisation. So, yeah, you may have specific content just for the organisation as a whole. But if you look to break that down into certain areas and have different onboarding user roles for different areas of your business, then that’s absolutely possible, and something you should pick up the phone and speak to your account manager about in more detail, to really understand how we can support you with that. Josh: Absolutely. So, you’re going to provide them with access to the information you require. So, if that is, sorry was it, medical details, for example, you can provide access to that specific page so that they can complete that information for you. You can obviously choose to highlight to them when they go through the onboarding content that that is a specific area you would like them to fill out. But the portal will provide them with the login, as it would, with any of your self-service users. You’re just limiting the areas that they can see, so they don’t get access to everything straight away, just those bits you need them to update. But your user could sit at home in that period, before they start with you, update all of the information you need, so your medical information, uploading any certificates or documentation that they have in that period. Cathryn: And then that would all be ready and available in their usual CIPHR profile on joining? Josh: It would. So, once they actually start their first day with you, you move their user role from being an onboarder to then just the user role you need for them moving forward. That then takes all the information that they have inputted already through to then their main profile as they move forward with you. Cathryn: So again, it’s just really alleviating some of that admin time. You don’t have to do data entry and reducing the risk that you might accidentally mistype something moving it from one electronic form to another. That’s taken care of because of the link. Josh: Yeah, absolutely. So, yeah, you’re completely reducing the element for error when you dual enter it, if you’re originally having to dual enter. Your employee is in control of their data, their information. They’re putting in exactly what they need you to have access to, and then that is seamlessly moving with their profile as they grow within the organisation. Cathryn: Great, Fantastic. Michelle, I hope that answers your question. Something we touched on, Josh, was that new starters, in fact, can access this from the comfort of their own home. Is there any restrictions around the devices they can use to access CIPHR Onboarding? Josh: No. As long as the device is internet enabled, your user can access at anytime or anywhere in the same way as they would, your current employees would, with their self-service element of the system. So, like I said, at home using any device as long as they’ve got their Wi-Fi turned on, they can get on and do this at their own leisure. Josh: So, you’re going to be setting the user up on the system with an onboarding user role. So, they’ll be set up with a company email address, that you’ll be doing through the system, at which point you will send them…I think something we do is send it in two separate emails, so you’re not combining all of the login information in one. So, you send them the username, or your new email login, and then a password in a separate email. You may also then have things like two-factor authentication to log in to the system, whereby they’ll have to receive a text message to log in as well, if that’s something you have set up already. But yeah, you’re right, want to make sure that providing them with their login information is as secure. So whether that’s sending them in separate emails or using other methods, you know, providing them a trusted login to the system, we will make sure that you can facilitate that. But if you’ve got any concerns or queries regarding this, I suggest having a more in-depth conversation with your account manager to really understand what you’re looking for so that we can support and facilitate you there. Josh: So, you’re looking at around a six- to eight-week lead time. This allows for then your implementation and deconfiguration of the content in working with you to complete and get this right to ensure that it’s conveying the message that you are looking to provide to your new employees. So currently we’re looking at around about a six- to eight-week lead time. Josh: So, we’ll work with you. It’s obviously an ever-evolving process. Information changes, companies change, goals change. We absolutely understand and support that. So, it’s just a case of, if you’ve got your onboarding set up, you let your account manager know if there’s any changes. That goes back to our technical consultants to work through and make those changes with you at a later date. So, it’s absolutely not a case of setting it up and that’s it forever. If there are changes, tweaks, amendments you need to make, then by all means, we are able to support and facilitate that as you move through. Cathryn: Fantastic. And we had a couple of other questions about the ability to tailor the experience for different roles, different countries, different contract types, different offices. I feel like we kind of touched a bit on those, Josh. But just to confirm, that is possible, that is configurable as you have defined it yourselves. Josh: Yeah, absolutely. If you’ve got different countries, for example, needing to see different rewards or benefits there, we’re able to work with you to set up specific pages for those countries or user roles. So again, they get the correct message, which is tailored for them and is relevant to what they’re doing. Cathryn: Okay, thank you. And one thing I wanted to pick up with is you talked a little bit about the policy-acceptance feature within CIPHR Onboarding. Is policy acceptance available outside of onboarding for other user roles in CIPHR? Josh: Absolutely. It was just an opportunity to touch on an important element of the system as well, which offers a great benefit to a number of our customers already. It’s absolutely usable through any user role within the system. It’s just a great opportunity, especially as an onboarder. We all know that that first day or so being in an organisation, you sit down, quite often in a room, reading through policies, signing them off. So, it’s a great opportunity to tick that box, so to speak, before the user’s even set foot in the building. But it then is a tool, which is supported throughout the life cycle of the employee and, providing you have the policy acceptance module with us, you can use that at any level within the organisation to sign off policies, update policies, and keep that auditable log and trail of when they’ve been completed. Josh: It is an additional module. So, if you have any queries relating to that, please contact your account manager and they can discuss that side of things with you, in terms of looking to add that to your subscriptions. Cathryn: Okay, thanks Josh. That comes to the end of the questions that we’ve had in from you, our lovely audience. If you have any further queries about the onboarding module, don’t hesitate to get in touch with your CIPHR account manager, or give us a call and we will be happy to help you. It just remains for me to say thank you, Josh, for sharing your expertise with us today. Thank you to our audience for being so engaged and asking so many insightful questions about the product. If you do want to find out more about CIPHR Onboarding, or perhaps CIPHR Learning, which Josh mentioned, integrates really nicely with onboarding, just check the relevant option that you’ll see on the exit survey when this webinar ends, and someone from our team will get in touch with you to discuss what you want to know about it. We hope to see you at the CIPHR webinar again soon. Thanks again for your time. Have a great day. 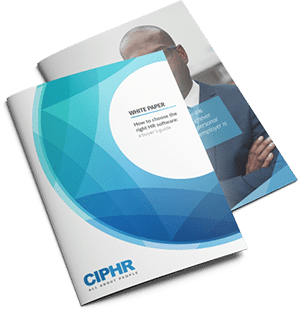 CIPHR host Cathryn Newbery and account manager Joshua Brown demonstrate CIPHR onboarding and discuss how a positive induction experience for your new employees can alleviate the administrative burden on busy HR teams.